"Just a note to let you know that after about 1 year remarkable improvement in our pin oak (I think, as it was bought as red oak). I tried a lot of 'juices' for about 2-3 years to help this tree out but it only got worse every spring/year and feared it would die. Nursery said there was nothing we could do for it - yea right - but your stuff did the trick. Cant wait to see how it looks next spring. Again thanks for the help." Measure the diameter of tree trunk 3 feet above ground level. Use one Spike for every inch of diameter. Place Spikes into moist soil, equally spaced around the dripline. (See illustration). For acid-loving shrubs such as azalea and rhododendron, use one Spike for every 2 foot of plant height, evenly spaced at dripline, never closer than 2 feet (24 inches) from trunk. "Enclosed please find the picture of the azalea after 4 weeks. This after the application of 3 iron tablets." 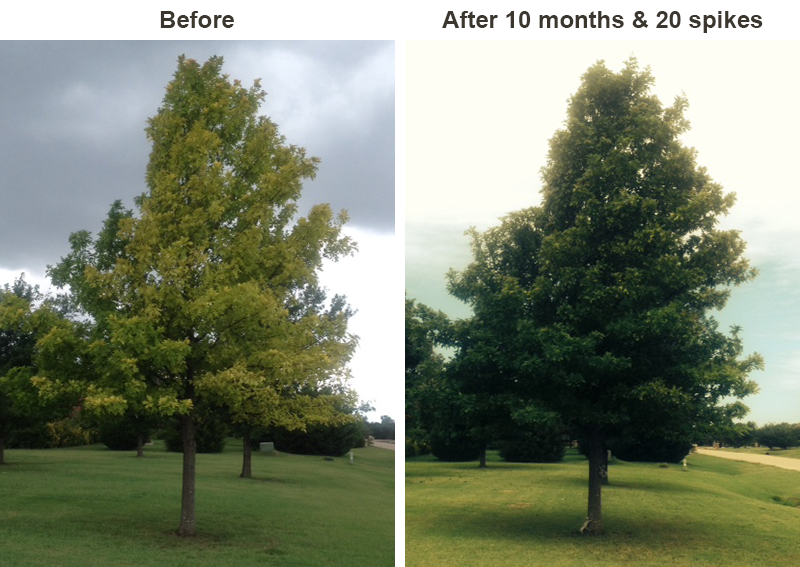 Lutz Iron Tablets treat Iron Chlorosis (Yellowing) in Pin Oak, White Oak, Red, Oak, Silver Maple, River Birch, Pines, Crabapple, Sweet Gum, Magnolia, Dogwood, Holly, Poplar, Juniper, Rhododendron, Azalea and other acid-loving trees, shrubs and plants. As high pH is often a factor in Iron Chlorosis, the 20% elemental sulfur in the Super Iron Chlorosis Tablets creates an environment in the feeding area that frees up iron, and along with the 5% nitrogen, assists in the plant's uptake of the tablets 30% iron. Favorable color responses are normally seen anywhere from 3 – 12 months from time of application, depending on soil structure, the amount of water/rainfall applied to the area and the type of plant being treated. Most favorable color response seen in new leaf. Use 4 tablets per inch of trunk diameter. Punch or auger the required number of holes two to four inches deep, spaced evenly around the dripline. Place tablets in the bottom of each hole. Close holes. 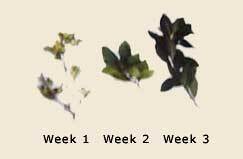 If chlorosis is severe, increase to six tablets per inch of trunk diameter. For shrubs, use four tablets per three feet of height. For azaleas and other flowers that are from one to three feet in height, use two to four tablets. Punch or auger the required number of holes two to four inches deep spaced evenly just inside the dripline. All Lutz tablets are made to feed for twelve months. Amending soils is an ongoing process - annual applications are recommended. Derived From: Methylene Urea, Iron Sucrate, Elemental Sulfur and Lignosulfonate. What our customers say about Lutz Iron Tablets for Chlorosis! "Thank you for your card of August 31st regarding our experience with your Super Iron Chlorosis Tablets. We use the Tablets on Azaleas and Rhododendrons and have had excellent results using them. We especially like them because they last longer than other iron we have used in the past." "Our Super Iron Chlorosis Tablets are doing an outstanding job for us. We are using them on Red Oaks, Sweet Gum, and Pine trees; and on Azaleas, Photinis and Hollies as well." "I wanted to write to you to tell you how pleased I am with the results I got from your Iron Chlorosis Tablets that I used on my pine trees. Your iron tablets provided green up and additional growth that I was unable to achieve with other soil amendments or fertilizers. ...I have approximately 100 pine trees on my property, and feel that the results I achieved with the iron tablets is a good indicator that your product works where others have failed. I appreciate having been introduced to your fine product."